Hi folks, quick post from me today – the first of my effort at painting up some NPC’s for a more narrative-based approach to table top gaming. I’ve been itching to paint up the amazing Colony 87 Lord & Lady since I managed to get hold of a set, (thanks Jon! ), and they were a natural place to start this particular project. I also added a young lady from the Spacelords range (Moonraker Miniatures) as an older daughter to complete the family, and I also included the old ‘Astropath Korm’ model as an advisor/tutor of some kind. I painted them all in the same way – a continuation of me experimenting with using inks over a white undercoat. The effect looks very different to my usual style – the pigment came out much cleaner and brighter than I am used to, and I’m not sure if I like the effect or not… I think I do, I guess I’m more comfortable painting in a grungy style but I don’t think that my usual approach would’ve suited these more aristocratic folks. I think I’m happy… yeah… I may go back and play a bit more with the faces, (makeup for example), but I’m calling them done for now. “The Conte & Contessa de Malocchio are the ruling family of the Sevelli Hive on Spero Secundus. Conte Fabian Malocchio is a former Vice Admiral in the Imperial Fleet, a man with a reputation for tactical brilliance and brutal efficiency. He retired from the Fleet some twenty years ago in order to succeed his own father when the former Conte was assassinated in a failed coup – his first act as Conte was to root the out the conspirators and have them and their families boiled alive – their skulls still adorn his throne room, bearing witness to his power and control. The Contessa Persia Malocchio is a powerful woman in her own right, a skilled politician and part of the ruling family of the neighbouring hive Verento. The ties between Sevelli and Verento are strong and ancient, and the marriage between Fabian and Persia can be considered a mere formality rather than an act of love. Persia plays the role of co-ruler perfectly, her political acumen complementing the skills of her husband. However, rumours abound of a sly and unnatural cruelty that lies in the hearts of all Verento nobility, and whispers of Persia indulging in sadistic torture and perverted lusts are passed fearfully amongst the servants. Fabian and Persia have two children – Lady Sophina and ‘Little Lord’ Fredo. Sophina is the eldest, and was conceived soon after the Conte & Contessa married. She is a strong, intelligent and fearless young woman who displays the pragmatism and determination of her father, and combines this with all the cunning and guile of her mother. Lady Sophina is also incredibly ambitious, and while she is single minded in pursuit of her goals, so far she has not evidenced any of the darker traits of either parent. Little Lord Fredo on the other hand, is an under developed, cruel and spiteful child. Despite appearances, is actually eight years old, and the household servants avoid him and his tantrums wherever possible… there are dark rumours that the child has an uncanny air about him. 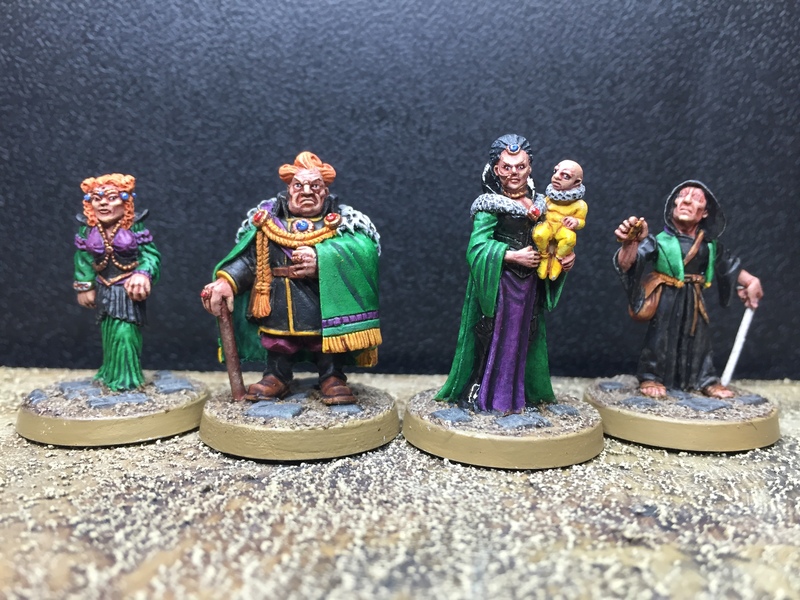 As ever – nice work :-) Always nice to see a few civilians getting models and including a family of aristocrats opens up all kinds of narrative options for games. Have to admit I find working over a white undercoat a real trial but you’ve pulled it off nicely. There’s something about the Conte reminds me of Baron Harkonnen from the Dune TV series. Pretty nice, I concur, they all have that true aristocratic air. The colours of the House turned out good, a nice touch to make them look related. Good job! Great job, love the eyes. I’ve never really been brave enough to attempt eyes. That baby is creep as hell. For me he is a cross between the Mono=Brow baby from The Simpsons and Mini-Me from Austin Powers haha. Thanks mate, I always try to do a good job on the eyes, it adds so much to the model! Give it a go mate – practice, practice, practice! :-) Oh, and yeah… that baby is a nasty looking piece of work… love it! Nice work here. The shared palette really brings them together – even the very old Astropath – as a solid “set” of figures.